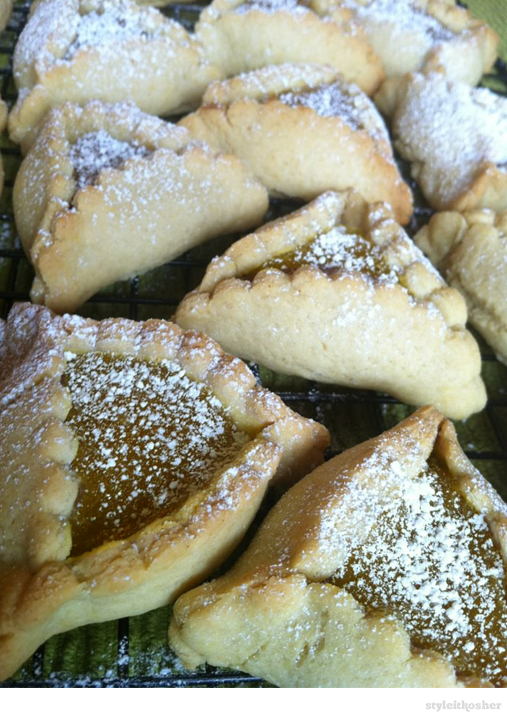 If you like lemon bars, then you’ll love these Lemon Bar Hamantaschen. As I continue preparing for Purim, my hamantaschen creation marathon goes on. Stay tuned for one more hamantaschen recipe coming up this week! Dough recipe modified from New Kosher, and filling modified from The Nourishing Apron. 2) Sift together the dry ingredients. 5) Form 3 balls with the dough, wrap the dough in plastic and refrigerate for 15 minutes. 1) Combine arrowroot or tapioca, baking powder and baking soda in a medium bowl. 2) In another bowl, combine eggs, lemon juice, lemon zest, honey, palm sugar, and maple syrup. 3) Whisk wet ingredients into dry until dry ingredients are completely dissolved. 4) Pour mixture into a medium saucepan on low-medium heat, and whisk continuously for 8-10 minutes until a thick custard forms. Be very careful to continue whisking on a lower flame or the eggs might scramble. Allow to completely cool. 1) Roll out with a rolling pin until dough is 1/8″ thick. 2) Cut 3.5″ diameter circles with a round biscuit cutter (or use the top of a drinking glass). 3) Place a small dollop of lemon custard in the center of each circle. Using the edge of a knife or small off-set spatula, fold up 3 sides and pinch each corner to form the hamantaschen shape. Turn over and smooth any cracks on the bottom of each cookie.